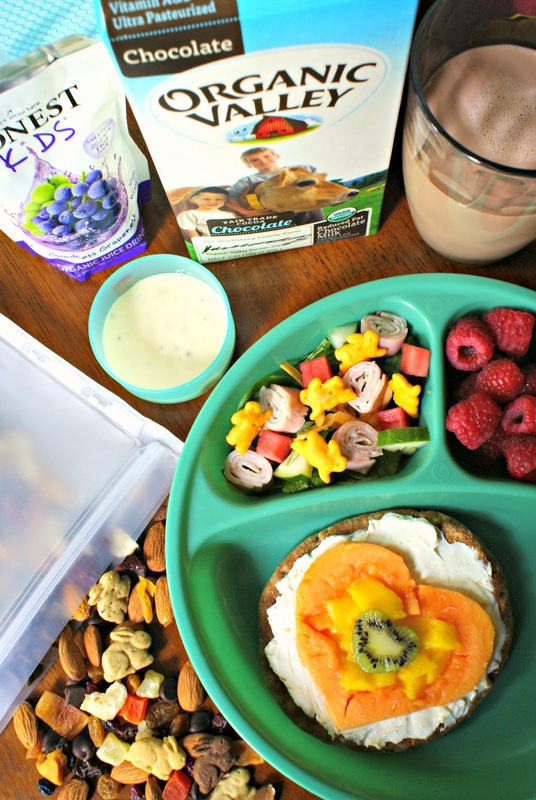 Healthy Lunchbox Inspiration and a Rock the Lunchbox Giveaway! Get some healthy lunchbox inspiration with five fresh and creative lunchbox ideas featuring products from some of my favorite organic and natural food brands! Don't forget to enter my giveaway while you're here so that YOU can Rock the Lunchbox, too! Keep reading for the details. It's that time, folks. Summer break has come to a close and the kids are heading back to school. In my case, it's not back to school. This week we had our very first ever full school day. That's right, my oldest started kindergarten. We did have VPK last year, but this year is the full monty...five days a week, all day long. While I try to refrain from breaking down in tears at the thought of it, I'm doing my best to make sure that my little lady is prepared for all of the new and fun experiences that await her when she walks through the school doors. As much as my heart ached to be a fly on the wall during her very first big day at school, I had to trust that I have instilled in her the confidence, drive and heart to be the best that she can be in my absence. I have no doubt that she'll do great and bring smiles to the faces of her teachers and new friends. That's just the kind of girl she is. One of the things that I can do to help her be the best that she can be is to provide her with a nourishing breakfast and lunch to fuel her brain for a full day of fun and learning. I've been brainstorming all kinds of lunchbox ideas to keep things fresh and interesting throughout the year. That's why I was absolutely thrilled to be invited to partner with five leading natural and organic brands for Rock the Lunchbox. Rock the Lunchbox is in its second year of helping parents give kids what they want at lunchtime - more balanced, delicious options and variety to help parents find “better for you” ideas that kids are excited to eat. 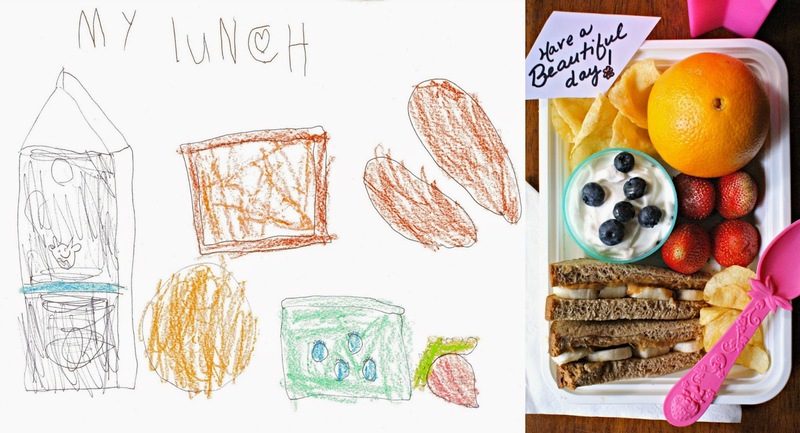 They have created an online library with nearly 300 lunchbox ideas and tips from parents and bloggers! Did you know that in a survey of more than 2,000 kids and parents, 72 percent of kids say it’s “cool” to have healthy food in their lunchboxes? Sounds like there's some pretty smart kiddos out there. The folks at Rock the Lunchbox asked me to have my daughter draw a picture of her perfect lunch. She sat down (unprompted on what to include) to draw and came up with a GREAT lunch! I was proud of her choices! She did include chips which aren't actually the healthiest choice, but potatoes are my fave so I can't fault her for it. What can I say? The apple doesn't fall far from the tree. Peanut butter and banana sandwich on whole wheat bread. On the side: An orange, yogurt with blueberries, strawberries and chips. 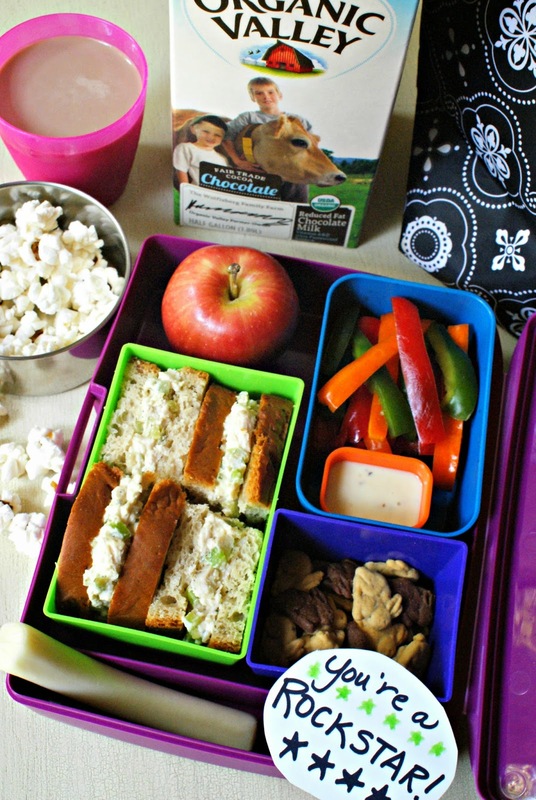 I've come up with 5 great lunchbox ideas that I know my little lady will love using some of the products from Organic Valley, Annie's Homegrown, Rudi's Organic Bakery, Applegate and Honest Kids! Organic Valley Cream Cheese on a whole wheat sandwich round topped with tropical fruit (papaya, mango and kiwi). On the side: Spinach Salad (topped with Applegate Natural Black Forrest Ham and Applegate Natural Herb Turkey Breast, tomatoes, cucumbers and Annie's Cheddar Bunnies) with Greek Yogurt Ranch Dressing, fresh raspberries, and trail mix (made with dried fruit, raw almonds, chocolate chips and Annie's Bunny Grahams). To drink: Organic Valley Chocolate Milk and Honest Kids Organic Juice Drink. Featured Packaging: Blue Avocado Reusable Storage Bag. Chicken Salad Sandwich on Rudi's Organic Bakery Gluten Free Bread. On the side: Annie's Bunny Graham Friends, bell pepper strips with Greek Yogurt Ranch, Organic Valley Stringles string cheese, popcorn and an apple. To drink: Organic Valley Chocolate Milk. 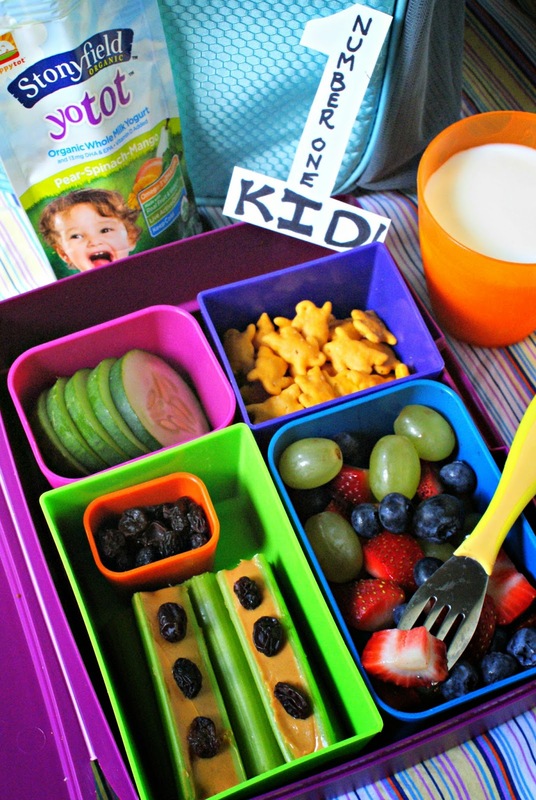 Featured Packaging: Laptop Lunches bento box and Kids Konserve Stainless Steel Container. Applegate Natural Smoked Turkey Breast, tomatoes and fresh spinach on whole wheat pita bread. 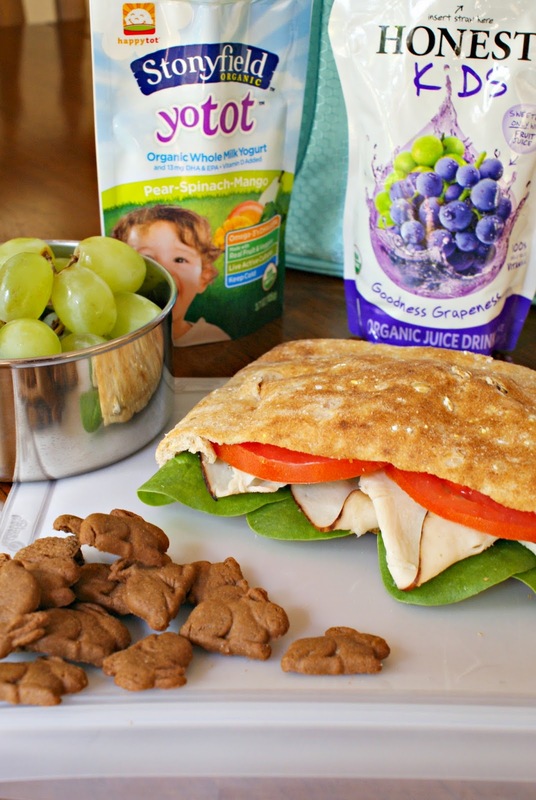 On the side: Annie's Chocolate Bunny Grahams, Stonyfield YoToddler Yogurt Pouch and fresh grapes. To drink: Honest Kids Organic Juice Drink. Featured Packaging: Blue Avocado Reusable Storage Bag and Kids Konserve Stainless Steel Container. Applegate Half Time Turkey and Cheese (Applegate Natural Turkey, Applegate American cheese, Annie’s Buttery Rich crackers, Annie’s Fruit Snacks and a strawberry Stonyfield Organic YoKids Squeezers yogurt). On the side: Fresh strawberries. Featured Packaging: Kids Konserve Stainless Steel Container. Celery with peanut butter and raisins (ants on a log!). On the side: Fruit salad (with grapes, blueberries and strawberries), cucumber slices, Annie's Cheddar Bunnies and Stonyfield YoToddler Yogurt Pouch. To drink: Organic Valley Lowfat Milk. Featured Packaging: Laptop Lunches bento box. For more lunchbox inspiration check out my Rock the Lunchbox post from last year and stop by the Rock the Lunchbox website. To join the conversation use hashtag #rockthelunchbox. You can even submit your own healthy lunchbox ideas! All products and coupons were provided to me free of charge. As always, all thoughts and opinions are 100% my own. I love to pack homemade soup. I just love your site! You are helping me so much with packing delicious healthy lunches for my family!! Thank you! Hard boiled eggs. My daughter loves them! Fruit! My son loves all kinds. I like to include baby carrots with either hummus or ranch dip. I like to include carrots...my second choice (and my kids fav) is grapes :) Thank you for the wonderful giveaway. I like to include hummus and pita chips! Thanks for the opportunity! Colin LOVES to eat carrot chips with dip, always fruit!! My daughter loves cucumber, so I love to put cucumber slices with raisins. 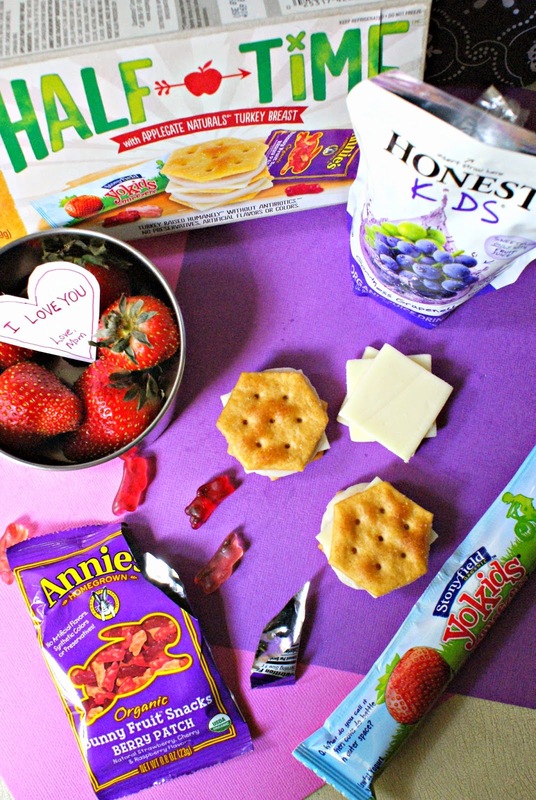 My kids love fruit salad and homemade lunchables! I love to pack yogurt! I love packing fresh fruit and pretzels. All my kids agree that grapes are the best.